Zentangle — even if you are convinced you have no artistic talent. It increases focus and creativity, provides artistic satisfaction, and increases your sense of personal well being. The Zentangle method is enjoyed all over the world by people with a wide range of skills, interests and ages. Creating Zentangle art provides a fun and lighthearted way to relax and intentionally facilitate a shift in focus and perspective. 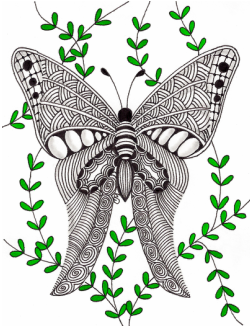 The Zentangle method encourages you to not have a preconceived idea of your final result. Following this somewhat unusual approach, your creation is not restricted by your expectations. Everything you need to create beautiful Zentangle art can fit in your pocket. This easy to learn method of relaxed focus can be done almost anywhere, alone or in groups, without any special abilities or costly equipment. A Zentangle tile is 3 1/2 inches square and is designed to be completed in one sitting. You can finish one in less than half an hour and you get an immediate sense of accomplishment. Your Zentangle creations will be respected and treasured works of art. Unlike other methods of relaxation and focus, you not only feel good, but you get a bonus of beautiful art to be appreciated, collected and reflected upon for years to come. The Zentangle tools and method are not limited by technology. Your creativity is not directed by how someone else wrote a particular program, nor does it need batteries or electricity. The Zentangle approach provides a counterbalance to our increasing use of computers, mice, screens and keyboards. It returns us to that fundamentally human behavior of putting marks on paper. Nothing is pre-programmed. Your creativity is your only limit and the Zentangle method has a way of increasing and inspiring expression of your personal creativity. In Zentangle, you draw each stroke consciously and deliberately. As you make a deliberate pen stroke on your Zentangle tile without concerning yourself about what it will look like when you are done, that very act of putting your pen to paper focuses your attention in a special way. As your eye follows your pen strokes your attention shifts to a state that allows fresh thoughts, new perspectives, and creative insights to flow unhindered by anxiety or effort. There is no eraser in life and there is no eraser in Zentangle. However, in creating Zentangle art (and in living life), you will discover that apparent mistakes can be foundations for new patterns and take you in unexpected and exciting new directions. Unlike much art, or most activities, you start out intentionally not knowing what your Zentangle creation will look like. The Zentangle method allows you to discover new possibilities that you might not have anticipated when you began. A Zentangle creation is meant to be non-representative with no up or down. Since it is not a picture of something, you have no worries about whether you can draw a specific object such as a hand, or a duck. You always succeed.